Home » old old gold » So this hasn’t (really) been sampled? So this hasn’t (really) been sampled? That thing when your favorite band talks about their favorite band. Geoff Barrow of Portishead mentions Can, and wow. 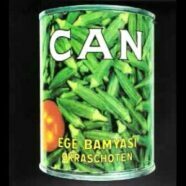 Vitamin C (from Ege Bamyasi). I couldn’t tell if I’d heard it before or if it was just one of those songs that’s so funky that it feels like it always existed? I checked whosampled.com and nothing was familiar, but either way, wow. Also, this post was inspired by a ridiculously serendipitous moment. I’d heard the song earlier in the week and was thinking about it driving to work when it CAME ON THE RADIO right then. Obviously, courtesy of FSU’s V89, for no one else around here would possibly ever ever ever play such a song.